With the use of NASA’s Chandra X-Ray Observatory, Swift Gamma Ray Burst Explorer, and ESA’s XMM-Newton, scientists were given a bird’s eye view when a star ventures too close to a black hole. The star gets ripped apart in the extreme environment and it looks truly amazing. Because of the intense gravity of a black hole, when a star gets too close, the tidal forces will rip the star apart. These events are called “tidal disruptions,” and with this tidal disruption, called ASASSN-14li, astronomers observed some of the stellar debris sent outward at high speeds, while the rest continued toward the black hole. The event happened in the center of galaxy PGC 043234, which is about 290 million light years away, making it the closest tidal disruption discovered in 10 years. The supermassive black hole is estimated to weigh a few million times the mass of the sun. The event was discovered during an optical search by the All-Sky Automated Survey for Supernovae (ASAS-SN) in November 2014. Artist’s illustration of the tidal disruption ASASSN-14li. According to NASA, after the star is destroyed, the black hole’s strong gravitational force pulls most of the remains of the star toward it. This infalling debris is heated to millions of degrees and generates a huge amount of X-ray light. 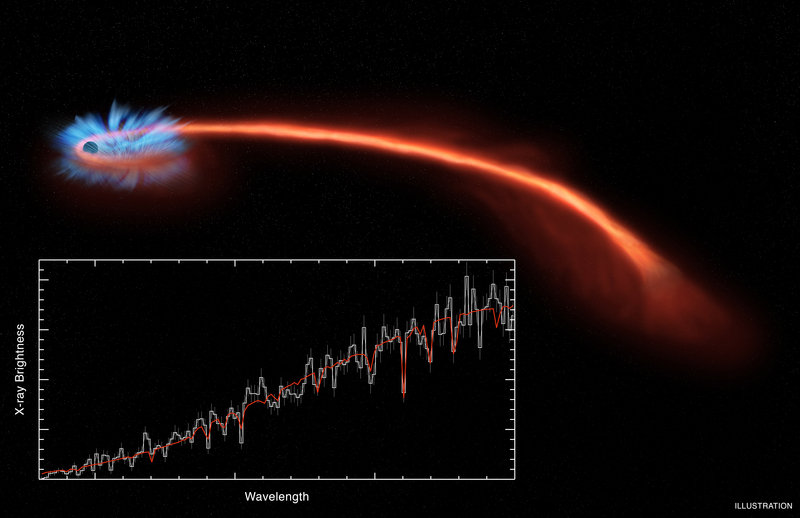 Soon after this surge of X-rays, the amount of light decreases as the material falls beyond the black hole’s event horizon, the point beyond which no light can escape. Scientists know that gas will often move toward a black hole by spiraling inward in a disk, but what remains unknown is how the whole process starts. By using X-ray light at different wavelengths (known as the “X-ray spectrum“), astronomers were able to watch the formation of the ASASSN-14li disk by tracking how that changed over time. “All previous observations of tidal disruption events revealed an already formed disc around the black hole. But this is the first time that we catch such a disc in its infancy, so we can study the details of how matter starts flowing from the shattered star towards the black hole and settles in circular orbits around it,” said Miller. The researchers determined that the X-rays being produced come from material that is either very close to or is actually in the smallest possible stable orbit around the black hole, NASA wrote. Jelle Kaastra of the Institute for Space Research in the Netherlands and co-author said: “The black hole tears the star apart and starts swallowing material really quickly, but that’s not the end of the story. The black hole can’t keep up that pace so it expels some of the material outwards. By finding more events like ASASSN-14li, astronomers are hoping they can test theoretical models on how black holes affect their environments, and how they affect anything that wanders too close.